More than once, I’ve had to stop reading a poorly edited book because I couldn’t take off my editor’s hat. Professionals in any industry observe others’ work and silently critique it. That analysis often leads you to one of two results: insight into what you could do better or a welcome relief because you are doing it better. Some of the presenters at Content Marketing World offer their out-loud critiques of what could be done better in content marketing. Use their observations to gauge what you’re doing well and where your content marketing program has room for improvement. The biggest mistake, the root of all evil if you want, is not committing fully to the cause. There is not much glamour in doing content marketing – it is a slow, sometimes grueling process that can’t be forced but must gradually penetrate all pores of an organization. It requires a passionate team that won’t give up easily, will pick their battles wisely, and most importantly will work consistently day in day out for a long, long time. It’s amazing, but I still see companies that post for the sake of posting, with no specific goals in mind and no plan for the type of content they want to create. They’re unhappy with the lack of results, their teams are frustrated with the lack of direction, and they aren’t even sure what they’re trying to achieve. Be thoughtful and deliberate in your content creation. The biggest mistake I see is taking too long to implement a good strategy. The battle against “short-termism” in content marketing is very real. So many marketers only care about here-and-now results rather than the long-term game … More often, we’re forever reminding our clients and team members to keep a collective eye on the ball. Sugar-rush results are tempting and temporary. Long-term results yield a greater return and snowball into lasting customer relationships. Putting out loads of content with no “ask” or capture is a big mistake. You don’t have to gate your content, but if someone gets to the bottom of your article/page and you don’t ask them to take a next step, you’ve lost an opportunity. All of the biggest mistakes fall into the category of creating something simply to fill an editorial calendar, not because it accomplished any other business or messaging goal. It’s a big mistake when people (and businesses) look at social media purely as a means to advertise. Every channel has its own type of culture with an unwritten role of engagement and connection. The example I highlighted is not isolated, most brands go into channels to sell from them instead of digging deeper to become part of the culture. Not writing for the web is the worst I’ve seen. It’s having something great to share, but making it literally unreadable – no subheadings, long paragraphs, no charts, no images. It is extremely hard to make myself read it and not run away immediately. Sometimes I cannot help but run away. Over 90% of websites are still ego-centric corporate brochures. What about resources and education for prospects and customers? Why do we have to dig so hard to learn something? Talking about yourself, with no value to the reader is the biggest mistake. In particular, corporate blogs that are nothing more than a self-promotional PR channel seem to be all too common. My biggest pet peeve is talking to your customer or prospect as if you don’t know them. Sometimes I see content with no regard for who is on the other side of the table (or computer screen). I see companies trying so hard to get their message across, which often results in spewing product marketing jargon in a one-dimensional outburst of features and benefits. We are not marketing “at” people, we are having a conversation with them and trying to teach them. We need to utilize any knowledge we have about them and weave it into our conversation just like we would prepare for a sales call or interview or any interaction. Rushing to create content by using assumptions and internal points of view rather than taking the time to really understand your audience and their needs is a common oversight. Research and consumer-insight gathering is a critical step in the planning process that is often missed by brands big and small. Some content marketers create content they think would be cool or interesting or fun without thinking about how it connects to revenue and how it connects to customer need. I’ll take it personal here. The worst mistake that I have made is trying to change everything at once. When you change too much at once, it can be difficult to know which change had the greatest impact. Someone recently revived an email list after not emailing me for over 18 months. It was a totally out-of-the-blue thing. It came with no explanation about why there had been a long hiatus. Now they’re doing monthly emails, and it all feels very artificial, like a forced march because they think they should be doing it. They don’t seem excited to have started communicating with me again, and I find very little value in what they’re sharing (it’s all about them). At this point it’s like a car crash – I can’t look away (i.e. unsubscribe) even though I should. The three most common content marketing mistakes I see are: 1) Irregular content delivery – the most successful content marketers make an appointment with their audience. 2) Chasing the social stream – instead of trying to be on every channel all the time, the most successful content marketers kill it on one channel at a time. 3) Targeting too broad an audience – want to be a killer content marketer? Get rich. Target a niche. Not considering your audience is the worst transgression you can commit. It’s the one mistake that is the great equalizer. It kills small business and large corporations alike. Broad coverage that pleases everyone might have worked when options were limited, but with the competitive content market we’re in, you need to identify one audience, fulfill one need, and dig deep to establish your dominance. Commit it to memory: Thou shalt not forget your audience. I came across a major household appliance brand on the internet recently. Its Nordic marketing team seemed to have fun creating vox pop videos about certain features of their goods. The videos were supposed to be funny, but they made my toes curl. They were supposed to drive engagement with their 50,000-plus followers, but there were just a handful of reactions. They were supposed to give a personal tone of voice, but they talked down to the audience. In such cases, content marketing is not just a waste of time and budget. It will scare people away and will cause damage to your brand. Make sure you tell your story the right way. If not, you are better off not working with content marketing at all. Brands forcing humor around particular social, news, or world events is a mistake, especially if they don’t really have an audience in that particular arena. A big mistake I see in content marketing is insensitivity to holidays/observances. The Martin Luther King Day sale! Anyone who leverages current tragedies or politically false information to promote a brand, product, or service is making a big mistake. Anything that begins with an executive sending a competitor’s content to their team and asking why they don’t do something like that. This happens ALL. THE. FREAKING. TIME. I can’t imagine a worse behavior. It’s effectively telling your team, “Hey, can we blend in a little bit more? Can we be more average? Let’s go do some commodity work, team!” Ugh. Hashtag no. This is broader than just content marketing, but the worst thing I see companies doing is focusing too much on matching what their competitors are doing and not enough time focusing on gaps and innovation. I have seen this mistake over and over and each time I am shocked when I see it. Companies will spend significant budget on content marketing but not build any system to measure the results. Unlike direct response marketing campaigns, content marketing requires well-structured analytics to prove the value of the efforts. Developing a plan for measurement and attribution is as important as the plan for the content itself. There is no value in investing in content if you don’t ever know what works. One of the biggest mistakes is not hiring someone to do content marketing full time. If you just have current employees try to create content in their free time or on the side, your publishing will be sporadic, unfocused, and eventually peter out when you don’t see results in the first six months. The most irritating trend I keep coming across is terrible research posing as “thought leadership” – content relying on extremely outdated stats or misinterpreted facts, often without adequate sourcing to help the reader assess what they’re reading. 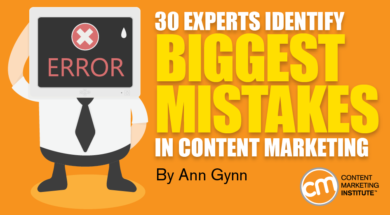 Publishing content that has little research or reason behind it is a big mistake. It annoys me to receive an email or see a post from a brand that offers me no value or helpful insight. That’s why I signed up or followed them in the first place, to get more value. Telling influencers you won’t publish their content is one of the biggest mistakes. If the content isn’t ready, help them get ready. If you don’t like the topic, help them with other topics. You will sever the relationship and potentially sway that member’s passion toward your brand to your competitors due to the rejection. The whole concept of selling to the heart and using emotions to sell comes with a tremendous responsibility that companies are failing to consider. The state of the heart of humanity around the world has been fragile. Humanity has endured over 50 years of fear-based messaging and the impact is telling. If you are going to use a strategy of selling to the heart, be incredibly mindful of doing no harm. It would be even better if you focused on leaving a trail of empowerment and healing behind you. I’m going to get meta on you. I hate callout culture. I see a lot of bullying among marketers who show off their expertise by putting other people down (e.g., “Look at this crappy email I received yesterday.”) While I understand there’s a lot we can learn from others’ mistakes, I wish there was more humility in how it’s done. When you blur out someone’s name, most people won’t figure out who’s being mocked, but the person being mocked is all too aware. That’s in poor taste, in my opinion. #KeepItKind. As you’ve read through the list, you’ve likely found a lot you’re doing right in your content marketing programs. And you may have discovered a few nuggets, an aha moment that helps you think about changing or incorporating something new into your content marketing program. So take a few deserved pats on the back and then hunker down to make a few improvements for even greater content marketing success. There’s still time to spend a few days learning more about how to grow and improve your content marketing. Join these and other insightful presenters at Content Marketing World Sept. 4-7 in Cleveland, Ohio. Register today and use code BLOG100 to save $100.